← Yes, More to Come! 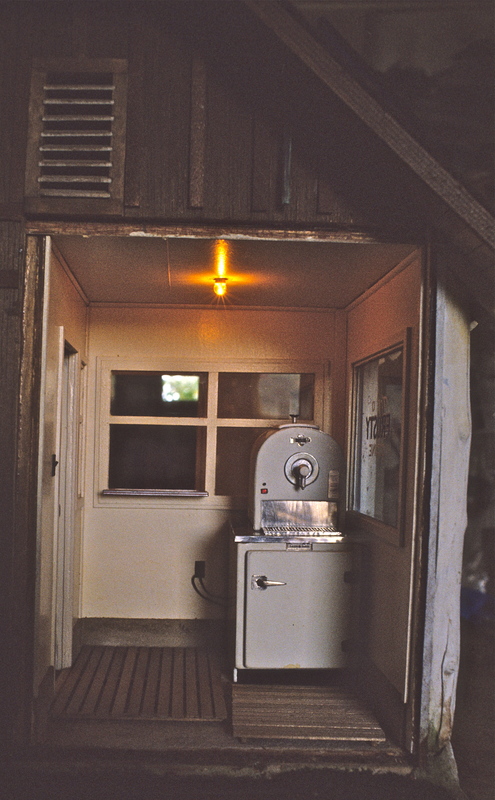 The project was a rendition of the real-life Big Bear (CA) Frosty Malt Shop (most certainly broccoli-free) opened in 1946 by a longtime collector and friend, and her husband. It was the first in a series of restaurants and chains they would establish over the years. The family opened so many, she kept a list in her purse for when she traveled. Alone, she traveled frugally, eating a sandwich in her hotel room, but with friends she was big-hearted. There was one night in Honolulu when she wanted to treat us to dinner. After leaving her apartment, we stopped on the sidewalk. Asking us what kind of food we’d like, she took out her list to see which ones they owned. As I recall, there were a dozen or more to choose from. On Frosty our pace slowed—we were beginning to feel the toll of years of 7-day work-weeks and multiple deadlines. After delivering the Greene & Greene, a huge project, we promised each other time to pursue other interests. For Noel it was painting. For me, writing. We continued to teach, but cut our studio time down to Mon.-Fri., leaving weekends to ourselves. When we were developing a class, the big project on the table went on hiatus. But Frosty had a charm that was hard to leave alone for long. What really hooked us into the project were some old B&W snapshots of the original building–an appealing little slice of history. The photos reminded me of the Archie comic books I devoured as a child. In my favorite, our friend and another young woman were sitting at the counter wearing Betty and Veronica-type sweaters, sipping malts, while their husbands stood by looking callow and proprietarial. In particular, Noel was won over by the quirky exterior wall structure of vertical log-cabin-style logs painted white. And then there was was the huge, two-fold neon sign advertising Big Bear Frosty Malt Shop guy-wired to the roof. How would we ever do that? Frosty was a 1940’s brand of soft ice cream. At the time, Big Bear was a small mountain getaway for people from Los Angeles. Through the front window of the shop you could see the white porcelain machine. It was easy to imagine lines of kids in the summer, waiting at the window for their ice cream cones. 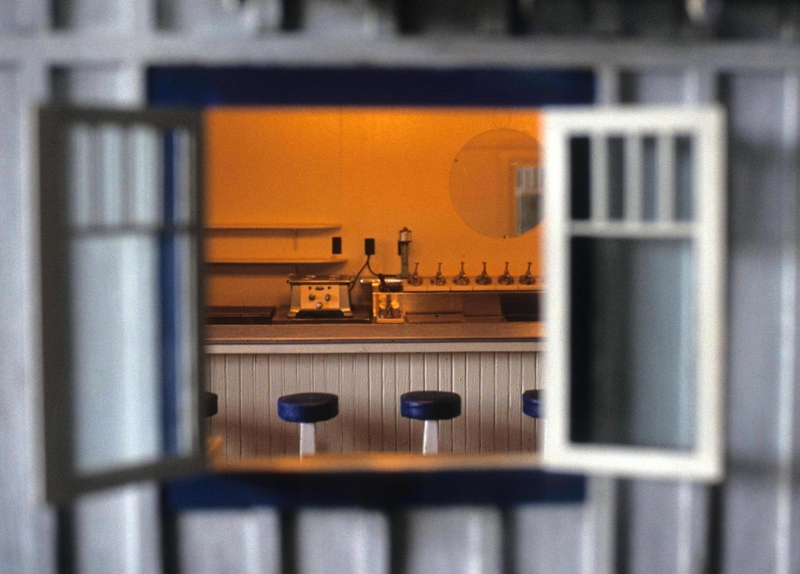 In our miniaturization, we edited down the original building, selecting the details that would create the illusion of the whole—what would give the viewer the feeling of the place, without it all being there. 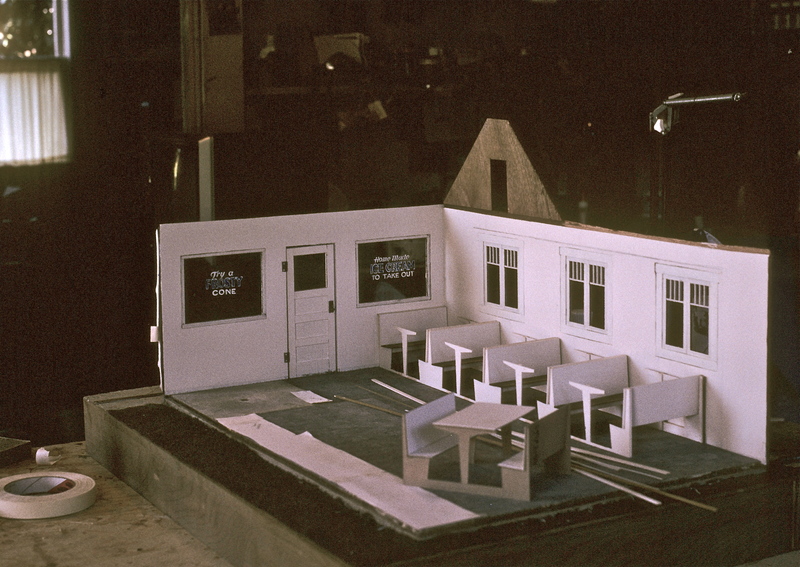 Because the real heart of the place was the main room and counter, we eliminated the kitchen addition, and trimmed the number of stools and booths to make it all more workable as a miniature. As we had learned, time and again, you don’t need all the details (fill-in-the-blank, i.e. stools or the exact counter length) to show what a particular room or building felt like. On the topic of editing your work, after a year or two of building miniature houses we were whining to fellow-builder Jim Marcus about how many pieces of wood we had to cut to build a window—64! It took forever. He pointed out the obvious—you’re not building a real window. Find the minimum number of pieces necessary to make the illusion work. If it looks like a Victorian window with 20, or even 11 pieces (it did), people will accept that and move on. Structures are full of details to entertain the mind. And who dictated how many pieces there should be, anyway? For Frosty, we saw the challenges were endless–recreating things like the linoleum tile floor, appliances and the big neon signs—none of which were found in our current bag of tricks. And there was the alley side of the building we had to invent for ourselves in a way that would convince the customer that’s how it really was, or close enough. To get an idea on how it would all come together, we built a boxboard mock-up. 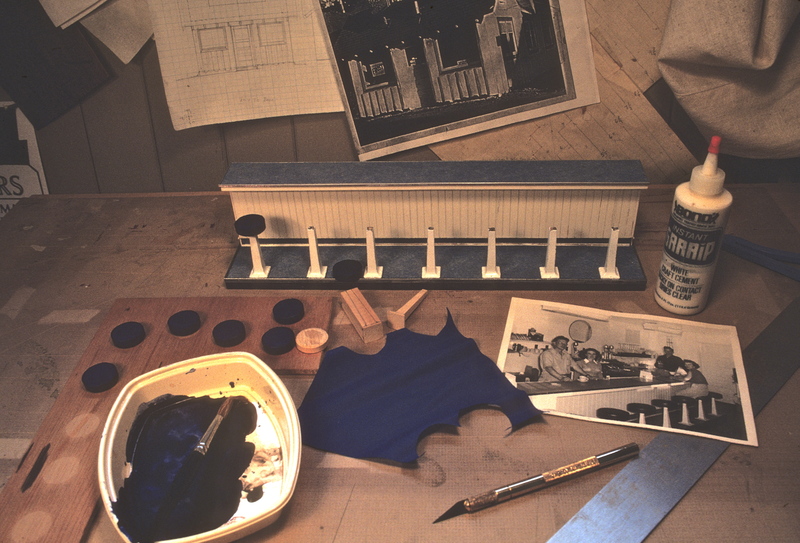 Then, working from the bottom up, Noel built the base of ¾” ply, then cut the floors and walls from ¼” ply. While Noel went on to lay cement sidewalks and build the booths, I started in on the grey and white linoleum floor—adapting full-size sponge-painting techniques from Paint Magic by Jocasta Innes. Today you could probably find directions on the Internet, or better yet, YouTube. For lack of a sea sponge to apply the paint, I cut tiny ragged pieces from a cellulose kitchen sponge. As a surface I chose bond paper for its smoothness, thickness, and ability to remain flat after painting. For paint I used Grumbacher tube acrylics—sponging on thin layers of light grey, medium grey and then touching in black and white, allowing each color to dry before applying the next. The key was applying paint in small areas at a time, to keep an even texture over all. Once done, I sprayed the whole sheet with Matte Finish Clear Spray which, despite its name, leaves a slight surface sheen. From there I cut out the individual tiles and began the game of mixing them up and gluing them to the floor. To age it, Noel went back in and cut some cracks with an Exacto, after which I added a dirty water wash, accentuating where wax and dirt would naturally accumulate. And I lightly sanded in areas of wear from the front door, past and behind the counter and under the tables and benches. Yes, we were that nuts, but that kind of detail is the fun part. Unfortunately we have no photos to show the results. To my readers: I’ve had another request for detailed information on how we did what we did. I thought I would do more of it on the blog, but found it a painstaking job–the stories of the projects are more fun, and I’ve forgotten so much. The directions to many elements, like the appliances, were never written down, as they’re too complex. As our students can attest, much of our teaching was in live demos, as the directions made no sense on paper. I did write in detail for Nutshell News, covering many of our projects and techniques. The issues are, unfortunately, out of print, and I’m not allowed to copy them here. My best suggestion would be to contact The Camp, or Small Stuff, two mini chat groups, to see if any of the subscribers would be willing to copy the articles they have. Make sure to offer them a reasonable price for copying and mailing. 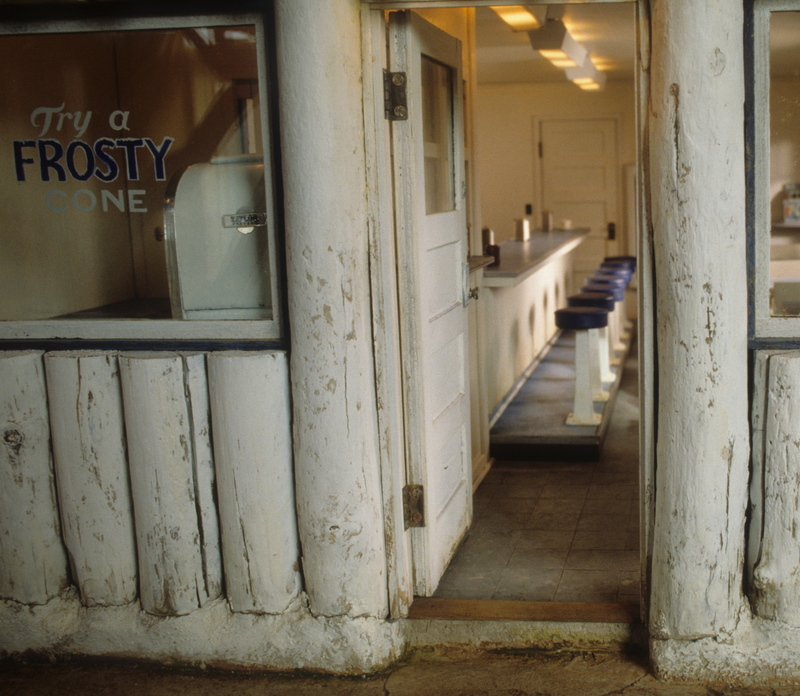 I wrote about Frosty in the October 1991 issue. Thank you for your patience and comments. Please stay tuned for more, and eat your broccoli! This entry was posted in Memoir, Miniatures and tagged architecture, Big Bear CA, lifestyle, miniatures, Roadside architecture. Bookmark the permalink. So sweet…. and I was eating ice cream when I read this. Sorry about the broccoli but I like carrots better. This entry was well worth the wait! Such a finely detailed miniature, and clearly representative of Big Bear’s rustic/vintage charm. In 2001 I had been doing minis only about 4 years. I had read Nutshell News articles written by you and gained a real appreciation of your aging/weathering techniques. From that time, “new” was of no interest to me. I made a rather large setting for my “Depression Era Farmhouse” which I entered in the annual contest held by Hobby Builder’s Supply. I had such fun doing the whole scene & making it look old and weathered. Because of your wonderful work and my attempt to emulate your work, this entry won the grand prize. I will always thank you for inspiring my old, weathered, used minis! How great to hear that Rita, your award was well deserved! Oh this is beautiful! I remember Mr.Frosty ice cream on a truck. Same stuff? I have no idea. We didn’t have it where I was raised. Thank you for the detail you write about your wonderful pieces! The details make it so much extra special. I have been a fan of you and Noel’s for years and have saved and hunted for every article you have written. I wish I could have seen the detail on the linoleum with the cracks, it must have looked so real. Did you write on the linoleum in any other articles? I remember that stuff in our home growing up. We had it here in the N.E., some people even used it on counters! I think I asked you about writing a book before but I was thinking, you could probably put one together just using past NN articles! Pat, I just thought of a question. Do you have a list of the articles you wrote? I think I have all of NN you wrote but not sure and did you write for any other publication? Glad to hear you’ve enjoyed our work. I so enjoy these descriptions of your projects. They provide me with so much information. I can only dream of ever doing anything on the scale (no pun intended) that you do. Your work is just amazing. I love you PST. You rock! ‘Cause you’re such a good writer. Thanks, Quigley! You’re not so bad yourself.